Hardest parts: Although I didn’t struggle with the diet, I had a difficult time at the end with nearly constant hunger. This was also accompanied by weight loss, so I think I just need to eat more. I thought the exercise plan was quite reasonable, but my back was giving me too much pain most days to exercise. Even as a child I wasn’t much one for spontaneous play, and this certainly hasn’t improved with age. I prefer to focus on a task until it is done rather than take breaks and have to figure out where I left off. Best parts: The single best part of this transformation was reconnecting with my family. I had been spending too much time on my computer and not enough time with my family. I was devoting my emotional energy to work and then coming home and spending time on social media instead of real social interaction. Jewel especially has gotten excited about trying new Paleo recipes, and she has gotten more involved in cooking now, as has Tom. (Dora already is quite the cook!) The second best part is the diet itself. The food is so satisfying that I don’t miss grain products. I thought after awhile the novelty would wear off, but at least as of yet I am content to eat this way indefinitely. Remaining needs to improve items: I need to figure out a way to manage my back pain. I can’t predict when it will flare up, and I can’t take anti-inflammatories, so I am limited in how I can treat it. Also, I haven’t figured out a way to both get adequate sleep and exercise. The only time I can count on being able to exercise is very early in the morning before work. I’m working on going to bed earlier, and now that I won’t blog every day, maybe I can make that happen on a more regular basis. The other item I am still dealing with is hunger. I do not want to lose any more weight (or even fat for that matter), so I am adding back in starchy vegetables to see if this helps. I also quit tracking my calories for the time being so that I am not artificially limiting myself. Overall comments on 21 day challenge: My primary reason for attempting this challenge was to see if this diet would improve my back pain. It was disappointing to find that it didn’t help at all. Perhaps I need to give it more time, but I would think that I would have seen at least a small improvement by now. The improved relationships with my family have made the challenge worth it. Many of the daily challenge items were difficult or impossible for me because of the nature of the work that I do and the fact that I live in Alabama and it’s winter. I do feel that Sisson wrote the book with a southern California bias. Also I felt that the book was more geared to a single male lifestyle, or at least a male with no children. He addressed the issues of being a mother (especially a working mother) very briefly. I would have had more success with this challenge in the spring, when the days are getting longer, it’s warmer and the farmer’s markets are open. I do think that this was a great way to jump into the Primal life with both feet for those who are ready to make this leap. Other people may find it easier to slowly adapt parts of the diet and lifestyle over time. This wasn’t all that different to how I already ate, and I was already trying to follow the exercise program, so for me it made a lot of sense. I also enjoy cooking from scratch and absolutely detest most processed foods. Aside from not eating crap, I’m not a picky eater, and I’m open-minded about trying new foods. I think a picky eater, especially a picky eater in the typical American sense of wanting things to be breaded, deep-fried and free of anything green, would have a hard time with this diet. 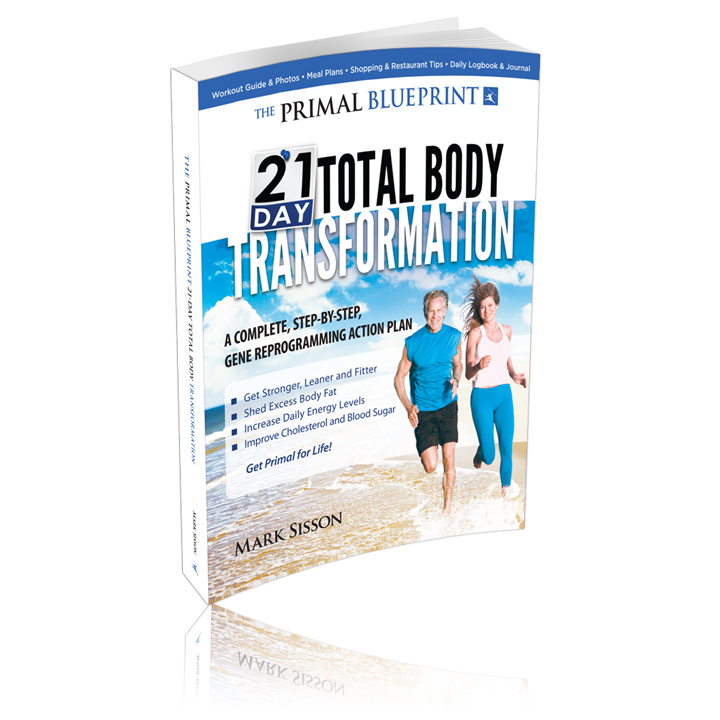 I recommend this book to anyone who is ready to make positive steps to optimize their diet, exercise and lifestyle . Thanks, Coll! I still plan to write most days, but I’ve been choosing writing over sleep lately, which has negatively affected my exercise. I’m trying for a better balance. Love you too! Thanks, Angela! I hope that you are right! I do plan to keep posting recipes, so stay tuned! I just downloaded my copy. I will start the 13th. Cool! I hope you enjoy it as much as I did!